Harvest 2018: the fruit of tradition, patient work and rituals that lead to the creation of excellent products. What’s inside a bottle of wine? From the first half of the twentieth century the Franzosi family cultivated with pride, effort and dedication the vineyard, in the heart of Valtènesi, starting from the hard work of grandfather Giovanni. (For further information: “Cantine Franzosi 2.0: combination of innovation and tradition“). Since then the seasons alternate, the strength of nature, the taking care of the territory of origin waiting for the fruits of the vine, until the harvest. Gestures and rituals that are repeated over the years, continuing to live in the expert hands of Bruno, up to his three sons Paola, Giovanni and Luigi. “The historical and anthropological value of the harvest dates back to very ancient times and has been handed down from generation to generation through methods of agricultural work and rural traditions. 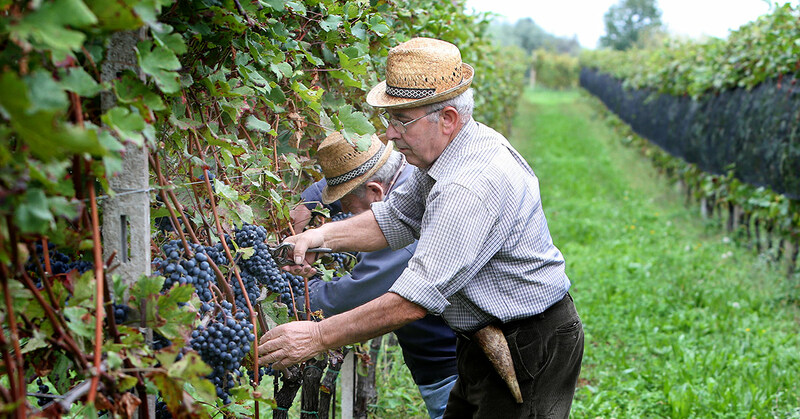 Even today it assumes a ritual moment, a social meaning and communion, in which men and women gather and work together for the same objective, among the rows of vineyards, surrounded by the colors and characteristic scents, a ritual made of fatigue and satisfaction” says Giovanni Franzosi. The vegetative season of the vine lasts about six months, from April to September. Normally the grapes take about one hundred days from setting to maturing, a period full of work to obtain quality wines. First you need to make a green pruning in order to create the right balance between vegetation and production. Towards the end of one hundred days, the grapes start to ripen and change color, the veraison, and it is at this moment that to increase the quality of the grapes, it is appropriate to thin the bunches, eliminating about 30% of the grapes, leaving only the best fruits on the plant, to increase the sugar concentration and optimizing the vine’s vigor. The grape become softer and inside important chemical transformations occur: the acidity is lowered and the sugar increases, the tannins are transformed and the substances responsible for the aromas and flavors are formed. There is no certain date, every year it can change depending on the climatic variations. According to popular wisdom on one hand if the summer has been hot and with little rains an early harvest will follow in early September; oh the other hand, if more fresh and humid it will start towards the end of September. In reality everything starts with a series of accurate tests to understand the right moment. About 20 days before harvesting, the sugar level and acidity of the grapes are monitored, taking several samples in the vineyard, taking them to the laboratory to examine the must. Some vines ripen quickly while others need more time. Not only that, the geographical position plays a key role, there are the vineyards that are distant only 1 km from the lake and mature first, while others are arranged along the hillside with a difference height above 200 m asl, and need a little more time. The Groppello, Barbera and Sangiovese grapes are the first to be harvested and expressed their typicality and pleasantness the best. Among the late varieties like Marzemino and Rebo, were intact, healthy, and with a perfect phenolic maturity after a natural over ripening and withering in grape vines. This year the harvest began around September 12th and lasted about 3 weeks. “A season that started with abundant spring rains that allowed an excellent balance of the vine even during the hottest and driest weeks of August. The perturbations that arrived between the end of August and the beginning of September were abundant and contributed to lowering temperatures. In this way the maturation has been rebalanced and the formation of primary perfumes was encouraged” explains Giovanni Franzosi. After harvesting the grapes, the loads are individually weighed, the sugar content is monitored as well the temperature of the grapes. Not only analysis and testing in the laboratory: the expert eye of Giovanni controls the ripening and health of the bunches, and place them in different wine-makers. After this examination, the first operation is de-stemming followed by crushing. Traditionally, the grapes were pressed with the feet, a gentle method, today the crusher-destemmer removes the stems from the clusters and lightly crushes the grapes. The must, with skins and grape seeds, is placed in steel containers for fermentation at a controlled temperature in order to facilitate the release of color and tannins from the skins. Yeast is added to the vats so that fermentation can take place. Carbon dioxide is released during fermentation which causes the grape skins to rise to the surface. Winemakers must pump over the “cap” several times a day to keep the skins in contact with the juice. After the maceration with the skins, more or less long, the wine is separated from the marc (drawing off). The fermentation continues until all the sugar has turned into alcohol and carbon dioxide. After several rackings and a more or less long aging in wooden barrels or steel tanks, the wine is bottled, followed by a period of aging in bottle. A little curiosity: The first vinifications are destined to produce the Valtènesi Chiaretto (see please: “Garda Classico Chiaretto DOP: icon of the territory.”). Giovanni takes a great care making this excellent wine, one of the most typical of Lake Garda. The Franzosi family knows how important it is to have a thorough knowledge of their territory, to obtain good results and an optimal harvest. With pride, Giovanni says: “The harvest ended and is for us one of the most delicate moments of the year, but also one of the most exciting and emotional. The grapes are cut from the vine by human hands with shears so for us is still manual harvesting, a craft work. Time has helped us to the last, while from the oenological point of view the harvest has demonstrated the presence of important sugary grades and remarkable acidity. The vintage will prove to be very interesting especially for white wines, because they will be characterized by a good acidity that means freshness and intense aromas. As for the reds we have harvested excellent grapes and we just have to wait”. The satisfaction flows in the whole Franzosi family and its team when Giovanni involves everyone in the tasting of the new vintages. “Now it’s a tradition, Giovanni shares with us the fruit of his hard work, I see his eyes shining and his heart is full of pride and it’s a great pleasure share these moments all together”, explains Paola .